Espergærde Sejlklub announces the regatta Nørrebro Bryghus Snipe Cup Trophy 2019 and The Unofficial Danish Championship 2019 of the SNIPE CLASS. Registration at normal fee due 25 May. After 25 May late entry fee (+50%). Please see details in NOR below. 1.1 The regatta will be governed by the RSS as defined in the Racing Rules of Sailing (RRS) World Sailing (WS). 1.2 The applying prescriptions of the Scandinavian Sailing Association and the Danish Sailing Association will be incorporated into the sailing instructions. 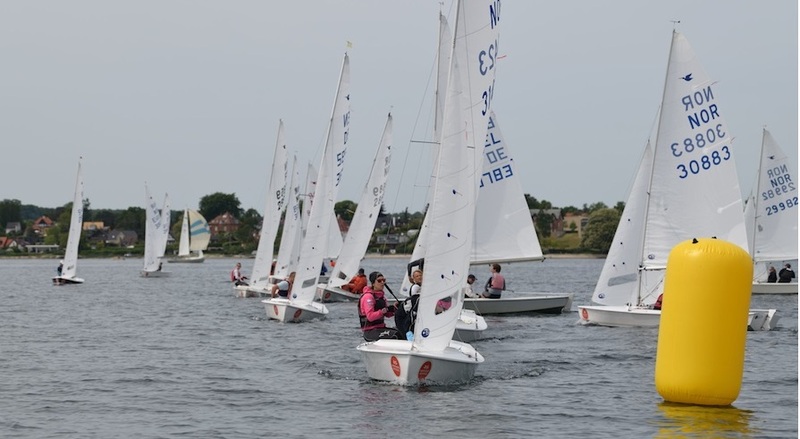 The SCIRA Rules of Conduct for Conducting National Championship Regattas will be incorporated into the sailing instructions. In case of conflict between the Notice of Race and the Sailing Instruction the Sailing Instructions shall prevail. RSS 30.2 and RSS 30.3 will be changed by a prescription of the Scandinavian Sailing Association. The base of the triangle in these RSSs includes the extensions of the starting line to the starting vessel and to a control vessel in the opposite end. The preamble to Part 4 (RSS 40) will be changed, to state that the obligation to wear personal buoyancy when flag Y is displayed not only applies while racing. RSS 44.1 will be changed so that the Two-Turns Penalty is replaced by the One-Turn Penalty. RSS 35 and A4 will be changed to state, that boats failing to finish within 20 minutes after the first boat sails the course and finishes or failing to finish within 1 hour, 50 minutes from the start, whichever is shorter, shall be scored Did Not Finish without a hearing. RSS 61.3 will be changed to fix the protest time to 60 minutes for competitors, protest committee as well as race committee. RSS A4 will be changed by stating, that at boat starting later than 10 minutes after her starting signal will be scored Did Not Start. The Sailing Instructions may charge other Racing RSS as provided by RSS 86. 2.1 The regatta is open to SCIRA registered boats and CLASS Member skippers who are in good standing with SCIRA for the current year. 2.2 Each competitor must be a member of an approved yacht club affiliated with World Sailing/National Authority. 2.3 Eligible boats may enter the regatta by using the online ENTRY FORM at www.snipe.dk. 2.4 Registration of participating boats must be made before June 8th 2019. There will be a late entry fee for entries after May 25th. 2.5 Advertising is permitted in accordance with WS Regulation 20. Boats may be requested to display advertising chosen and supplied by the organizing authority. To be paid at online registration. Entry fee includes social events and regatta dinner. 11:55 Warning signal of the first of races. If less than 4 races are completed Saturday, the race committee will try to complete 5 races on Sunday. If less than 8 races are completed Saturday and Sunday, the race committee will try to complete the scheduled series of 11 races on Monday June the 10th. 4.4 The attention signals for the following races will be made as soon as practicable. 4.5 No warning signal will be made after 14:00 Monday June the 10th. All boats shall produce a valid measurement certificate and are required to properly display the current Class decal. Boats are subject to measurement at any time at the reasonable discretion of the Class Measurer or the Race Committee. The Measurement Certificate shall be presented by control measurement. 7.2 The course will be located in Øresund off Espergærde Havn, Danish Chart No. 131. The courses to be sailed will be published in the sailing instructions. 9.1 The Low Point System of Appendix A will apply. 9.2 11 races are scheduled of which 4 races are required to constitute the Open Danish Championship. 9.3 When 4 (four) or more races have been completed, a boat’s series score will be the total of her race scores excluding her worst score. (Only one race will be discounted.). Danish legislation requires every boat to be equipped with personal buoyancy for the number of persons on board at any time. Support boats should be registered by contacting the regatta office or the Organizing Committee. There will be prices for every 5th competing boat. The overall winning team irrespective of nationality will be awarded with The PERSSON CHALLENGE TROPHY. Competitors participate in the regatta entirely at their own risk. (See RSS 4, Decision to Race.) The organising authority will not accept any liability for material damage or personal injury or death sustained in conjunction with or prior to, during, or after the regatta. In case of cancellation of the regatta, paid entry fees will be refunded, but the organizers assume no responsibility for any other expenses incurred by participants in connection with the regatta. Each participating boat shall be insured with valid third-party liability insurance with a minimum cover of DKK 5.0 mill. per event for personal damage and DKK 2.0 mill. per event for material damage or equivalent. Phone: +45 26 80 56 50. Information will be given on www.snipe.dk and at the time of registration, at the club and at the notice board. Registration implies that you confirm that the crew meets the stated conditions and requirements. The crew is a member of an approved yacht club associated with the World Sailing / National Authority. The participating boat has a valid liability insurance with a minimum coverage of DKK 5.0 million (EUR 671,000) per event for personal injury and DKK 2.0 million (EUR 268.400) per event of material injury or equivalent.